The Agivey Anglers Association has been proactively managing the fishery since 1973. The fishery is owned by ‘The Honorable The Irish Society’ a charitable organization and leased to the Agivey Anglers Association on long term lease. The Honorable The Irish Society’s estate is managed in Northern Ireland by Bann Systems Ltd. The association has an overall membership of about 400 including adults, juveniles and honorary members. The association is as previously stated very proactive. This is evidenced in the achievements over the last 15 years. With most fisheries in decline the association set about improving the situation on the Agivey. A hatchery was set up in 1989 with the capacity to produce 250,000 salmon fry each year. This it has done consistently year on year while continuously monitoring and measuring the fry stocks in all the feeder streams. A number of grants have been obtained since 1990 through the European grant structures totaling about £200,000. This has largely been spent on habitat improvement on the feeder streams including the improvement and creation of spawning beds, the cleaning and deepening of holding pools and the cleaning and maintenance of the river. As part of these initiatives a Fishery Manager is employed by the Association to manage and monitor all aspects of the river system. This web site is part of a grant initiative in 2004 under the EU Program for Peace & Reconciliation (Peace II), administered on its behalf by Dept of Culture Arts and Leisure (DCAL). The overall goal is to further progress the habitat improvement on the feeder streams. This is currently ongoing as off October 7, 2004. 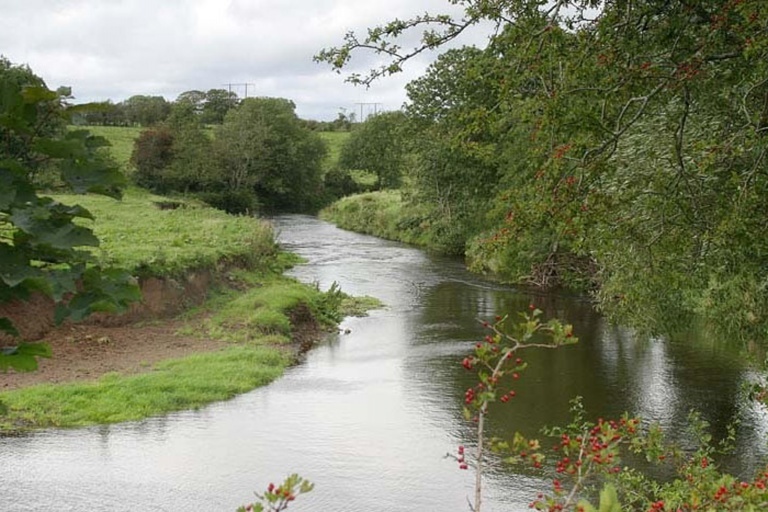 The Agivey River system is a tributary of the Lower Bann in Co L’Derry Northern Ireland. 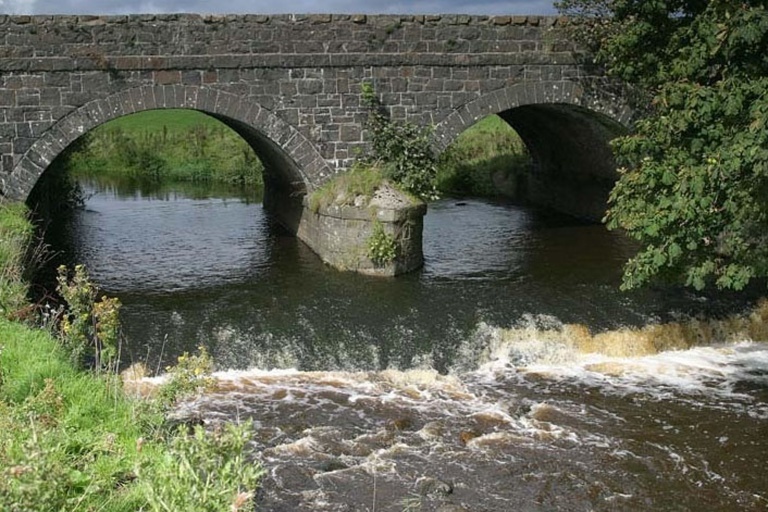 It enters the Bann about 8miles south of Coleraine and about 13 miles from the mouth of the Bann on the North coast. The Big Agivey has a fishable length of about 12 miles, and the Wee Agivey a tributary of the Big Agivey a fishable length of about 8 miles. The Big Agivey is a small to medium river ranging from about 10m wide at the mouth, 6m mid course and about 4m in the upper reaches. The Wee Agivey averages 3 to 4m for much of its length. Both rivers are described as spate rivers, rising quickly following rain and also dropping quickly. There is very little time that the river is unfishable. It is an excellent game fishery with both salmon and a very good stock of strong fighting Brown Trout, averaging 1/2 lb to 1 lb with a few to 3 lb. The heaviest recorded Brown Trout on the system was 7 lb 6 oz, caught by local angler the late Joe Bonnar. An excellent trout of 6 lb was taken in 2004 by local angler George Inglis. The International Rivers trout fly fishing competition has been held very successfully twice on the Agivey River with many compliments paid by the participating anglers, a fair few of whom have returned to fish at leisure. The Agivey is also well known as a salmon fishery with some spring salmon arriving in March, April and May. These are usually larger 10 to 15 lb salmon. The main run of salmon of which the majority are grilse in the 4 to 6 lb range run into the river in June, July and August if weather and water conditions permit. A number of notable salmon have been caught in recent years. This is most likely due to the fact that the salmon fishing traps on the Bann are now no longer fishing and larger earlier salmon can now return to the river. The heaviest to date caught in 2002 was 22lb 8oz caught by local angler Mervyn Norris. The previous heaviest salmon 19lb 8oz was caught by local angler Uel Linton. Prior to this the heaviest salmon was 18lb 12oz caught by local angler John Johnston in 1976. To counteract reducing numbers of salmon and the effects of pollution, the Association erected a hatchery on the headwaters of the Mettican Burn a tributary of the Big Agivey. The hatchery was erected in 1989 and has produced about 250,000 salmon fry every year since. 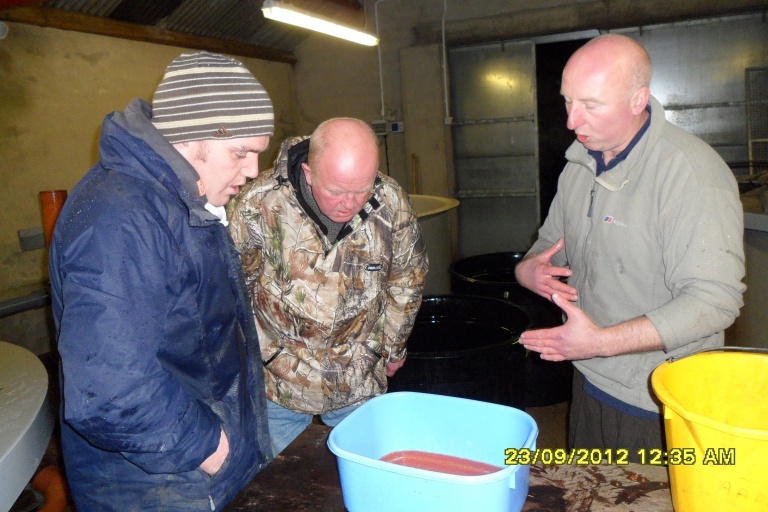 The Association now employs a fishery manager who looks after all aspects of the fishery on a day to day basis. As well as producing fry in the hatchery it is very important that we know where these fry are most needed in the river system. To understand this we carry out surveys on a wide range of locations throughout the river system every year. This allows us to maintain sustainable densities and importantly give us early warning of problems such as pollution, which can have a devastating effect on young fry.